Interior slab leveling made easy. PolyLevel® can effectively raise uneven floors inside your warehouse or commercial property with little or no disruption to normal workflow. 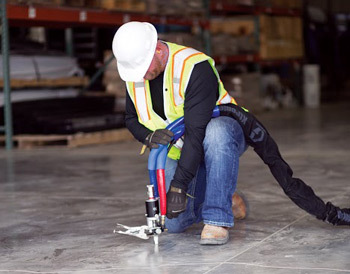 In many warehouse environments, minor voids under the slab or under control joints cause concrete flexing or displacement which creates unsafe working conditions, as well as maintenance issues with equipment. These voids are typically caused by traffic flow of heavy machinery coupled with poor compaction of the soils beneath the slab. 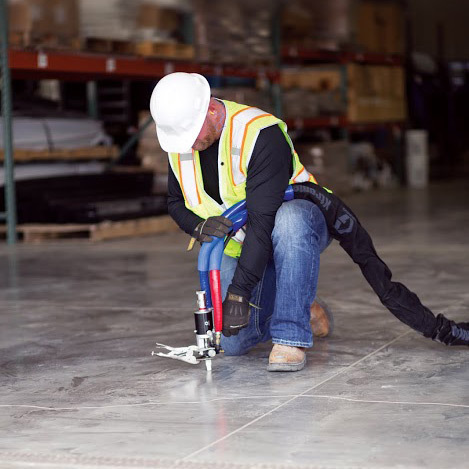 As the slabs begin to flex or settle, sags within the concrete and displacement at the joints often disrupt efficiencies and productivity within the warehouse. The PolyLevel® system provides a superior solution to fill voids, densify the soils below the slab, and raise the settled concrete. With its quick cure times, high compressive strength, and minimal disruption during installation, PolyLevel® offers an effective solution with little or no disruption to normal work flow. Safety hazards eliminated. A cracked, uneven sidewalk or driveway can create tripping and safety hazards. 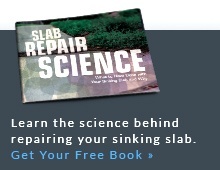 PolyLevel® repairs underlying soil issues and lifts your settled slab back to a level position. Concrete settlement and uneven floors affect commercial properties and office buildings everywhere. Whether the building was constructed on poorly compacted fill, water infiltration underneath the slab caused washout of the soils, or air leakage from under-performing duct work below the concrete resulted in shrinkage of the subgrade, this settlement causes significant damage to the interior finishes of the structure. Often, the damages are so severe that businesses are forced to cease operations until the problem is corrected. 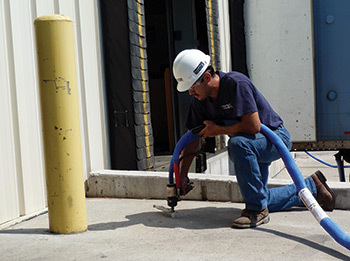 The PolyLevel® system offers many advantages over traditional methods of repair such as mudjacking or tear out and replacement of the concrete. With its ability to access tight areas, precise lifting ability, and quick cure time, PolyLevel® provides a superior solution for commercial applications that is unmatched. Unlike other repair options, the installation of PolyLevel® can also be completed in a matter of days, if not hours, without having to remove any interior finishes. This allows the tenants to continue working with little or no disruption to normal business operations. Interested in using PolyLevel® to repair an interior or exterior slab? Contact us today to request a Free Estimate, or you can reach us at 1-888-310-4467.